A surprising 60% of small businesses could not track the value of their social media activities in 2016, says Hubspot. How do you see your progress toward your social media goals? Learning from social media data is do-able! Data show you which efforts bring about the change you want. As your systems track interactions over time, you can see what engages people. When you can align your work with what matters to your readers, it’s exciting to see results. Do you work toward wishes or goals? Writing goals down may seem like a baby step. You may even think it’s unnecessary if you are a solo entrepreneur. But, clear goals cut wasted effort, and allow you to target just the activities that matter. Checking your data helps you learn what changes are achieving your goals. You may wish more people knew about your existence. Goal: More followers on your social media channels (at least 3% growth per month). Marketing activity: Become a resource. Curate great information. That means, find several helpful articles on topics your readers care about. Choose your own work or content other sources. Schedule one per day to post to your social media pages — your personal page and your business page. Wish: You had more customers. Goal: More website traffic from social media (post a link to a blog article on your site twice a week). Marketing Activity: Create powerful new headlines for social media links. Post the headlines on the social media platforms you like best. Then, reach out personally your friends, to ask if they’ll help you get the ball rolling by sharing it. Wish: You could more easily target the people who care most about what you do. Goal: Get more subscribers to opt into your newsletter. Marketing Activity: Add calls-to-action on each relevant page of your website. Offer a compelling benefit to your target subscriber. Here’s where to find data in the systems you are using, so you can see if that marketing activity is a good one for your goal. Go to https://analytics.twitter.com and login with your Twitter username and password. Explore the menu links at the top. If your goal is to extend your reach, look for monthly trends in these measures below. Impressions are possible views, not actual views. It helps you see distribution. It counts the streams that contained your tweet (according to Twitter’s analytics provider, Union Metrics). Impressions is not your number of readers – it’s a measure of your potential audience. You’ll see that some tweets will get into more streams than others. It’s a measure of overall exposure, rather than impact. And it’s used to figure out other measures, like engagement rate. If it’s impact you want, see tweet engagement and engagement rate next. Engagement counts your readers’ interactions with your tweets, such as likes, retweets, or clicks anywhere on the tweet as on the hashtag or link. Look for this data at your user account /tweets: analytics.twitter.com/user/yourusername/tweets. Or pick “tweets” from the main menu at analytics.twitter.com. It’s one measure of your impact on readers – they took action on your post. Engagement rate measures what matters to readers. It’s a percent of actions divided by impressions. What percent of possible viewers actually saw and did something with the tweet? Your followers are all the people subscribed to your tweet feed. A follower sees your tweets on their home page. Anything you post will be in their Home stream of new updates when they check Twitter. New tweets push old tweets down the stream and farther out of view. That is why it is important to post fresh tweets often if you want to nurture your following. You need a Facebook Page for your business to get data you can use. Personal Facebook pages don’t have the Insights feature you need. Go to https://facebook.com/yourpagename to access information about your Facebook visitors. 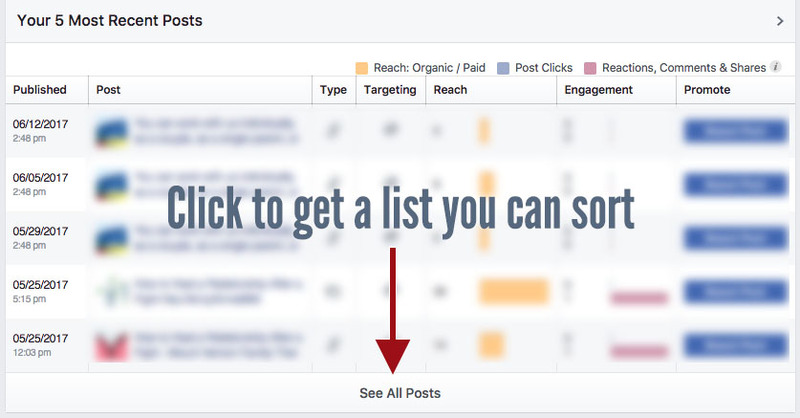 Click on “Insights” – a link at the top of your Facebook business page. This counts how many people could have seen any of your business posts, somewhere on Facebook. It tells you how your activity is doing overall in getting your posts in front of other Facebook users. Look for monthly trends up to see if your posts are expanding your reach. Reach doesn’t tell you which post got the most views. To see which posts had impact, see post engagements below. This counts who came to your page to see any part of it. It’s one measure of engagement — how many people come to learn more about your business from your Facebook business page. 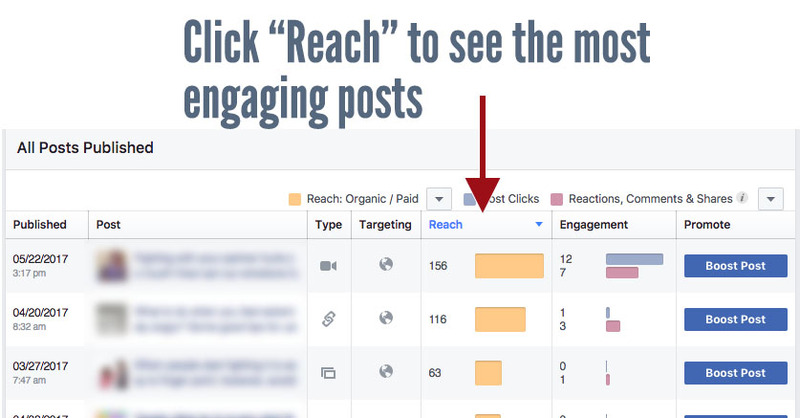 Facebook post engagements measure the total clicks on your posts, when readers like or share them. As a total, it reflects how interesting and helpful people find your updates. An upward trend over time means your posts are more often hitting on what matters to your audience, and they are helping widen your reach on Facebook. Want to see which posts engaged most people? First, scroll down to “Your 5 Most Recent Posts” and click “See All Posts” at the bottom of this chart. Then you can click on the headings in this chart to bring the most engaging posts to the top. If you post videos to YouTube, you have access to analytics. An easy way to view your data is to go to Youtube.com, then click “Creator Studio” to get to the dashboard and your data. Another way is view your YouTube channel home page. Look for a small graphic at the top of your channel, showing a total number of views. That’s also a link to your analytics page. On your analytics page you’ll see an overview that shows you how people interact with your videos. Watch time is a running total of the minutes your videos have played on any viewer’s device. One viewer re-watching counts the same as time spent watching by different viewers. If you want to measure your impact and engagement, you want to see this number grow over time, rather than stagnate. View duration shows how engaging your video is. Are people watching to the end? If this number is going up, more people are staying with you longer before they leave to view something else. If you want to build and reach an audience through YouTube, you’ll want this number to grow. There is much more data to see, and more to learn. These basics can help you quickly see what makes your target audience tick. 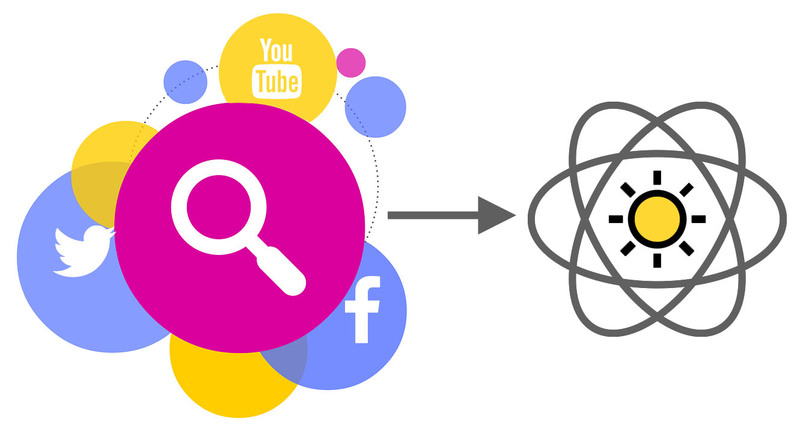 Now You Can Track Your Social Media Impact! What’s Next? Your social life online helps people discover you. You can tap into your social media audience can help your business grow. The main benefits of social media for your business are reach and insights into your audience’s attention. You can use your social media activity to pursue your other goals. For example, to bring visitors to your website. But social media results are only one part of a good marketing strategy. Use it as a tool to build your customer base. However, your social media following itself is not your customer base. They are customers of the social media service. To get the most value from building a social media following, invite your social circle to join your service, program or email list. Your social media audience has many distractions on sites like Facebook and YouTube. That’s why it’s one tool among others you’ll need. A strong social media following can help you study your market’s interests, find like-minded colleagues, and interact with potential customers in ways that benefit you the best. So, how can you best engage these followers instead of watch them go off somewhere else? Give your social media fans a way to opt into your own resource, such as your mailing list. There you can build your relationship and add more value to their experience on a distraction free channel. Turn earned media (on social sites) into owned media — on a channel you control, that is unique to you. Having goals and tracking progress helps you focus your efforts on what is working to grow your business. Focused effort is key to success that fuels itself. Update your channels now. Did this help you? Please share this post, and (bonus) say whether you agree or disagree!